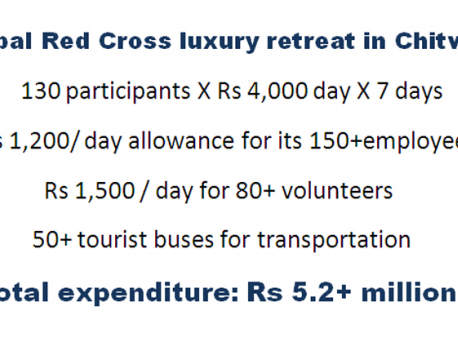 KATHMANDU, Feb 12: The Nepal Red Cross Society (NRCS) has been found defying government regulations and arbitrarily spending billions of rupees without the supervision of concerned government authorities. The humanitarian body has been not only found renewing its term by bypassing the Social Welfare Council (SWC)--the authorized government body to oversee the non-governmental organizations operating within the country--but also running its projects without receiving prior approval from the government body. This has put a serious question over the transparency of the humanitarian organization that has already courted controversy over embezzling huge amount of money received in the name of earthquake victims in Nepal. As per the SWC Act, non-governmental organizations (NGOs) seeking financial, technical or commodity help from foreign governments, donor organizations or international social institutions must apply to the council with complete details relating to their project and take the council's approval. Likewise, an NGO seeking renewal of its registration should get a recommendation letter from the council and submit it to the district administration concerned. However, the NRCS last year renewed its license for the next three years without following due process, say SWC officials. NRCS Treasurer Devendra Bahadur Pradhan admitted that the NRCS had not submitted details of its projects to the council because the NRCS has to pay SDC certain fees, which donors refuse to pay. "It is the district administration office, which renews the registration upon the recommendation of the council, which issues a recommendation after evaluation of the NGO's activities. But the organization did not come to the council. Chairman Sanjeev Thapa is considered to be close to the Nepali Congress and he used his political connections and renewed the registration with the help of the then Home Minister Bimalendra Nidhi," said an SWC office bearer privy to the development requesting anonymity. The official said that the NRCS had sought help from the home minister after the District Administration Office Kathmandu refused to renew the license without the council's recommendation. Likewise, for the current fiscal year, the central office of NRCS has allocated an annual budget of Rs 5.044 billion and has launched as many as 98 projects across the country. But NRCS has not even informed the council about the projects, let alone submitting details relating to the projects including donors. In the past years also, NRCS had carried out its activities without approval from the council. Vice Chairman of SWC Nilmani Baral said that the NRCS has been operating arbitrarily despite repeated requests by the council to submit its project details. "We have requested NRCS office bearers time and again to come under our supervision and not to operate arbitrarily. They tell us they would visit the council but never show up," he said. Hari Tiwari, deputy-director of the Evaluation and Monitoring Division of the SWC said that given the reluctance of NRCS to come under the council's supervision, the government has no knowledge about the financial and logistical supports NRCS receives from foreign donor organizations and how the funds are spent." "At a time when NRCS' lack of transparency is being questioned, the organization's reluctance to reveal their project details have raised further suspicions," he said. He said following media reports on the irregularities at NRCS, the organization had agreed to allow the council to evaluate its past projects and agreed to get its future projects endorsed through the council." "They submitted documents on 77 various projects. But after that, they simply ignored us. We have been repeatedly asking them for evaluation," he said, adding, that SWC was preparing writing a follow-up letter to NRCS to come under its supervision on Sunday. Vice-Chairman Baral said the SWC would have already initiated legal action against NRCS if it was any ordinary organization. "We have remained soft toward NRCS in view of its reputation. We agree that Red Cross is an internationally renowned organization but it should also follow the law of the land. So, we have been requesting them time and again to come under our supervision," he added. He said that if the NRCS continues to ignore the council, the council will be forced to take legal action. 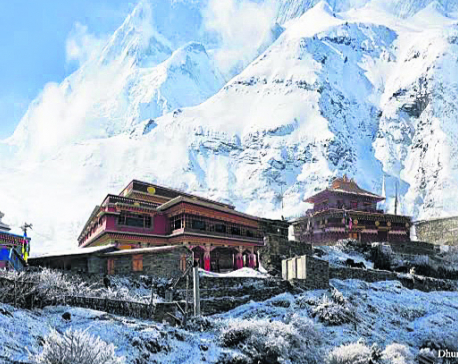 However, Treasurer of NRCS Devendra Bahadur Pradhan admitted that the NRCS had not submitted details of its projects to the council because the organization will have to pay the council certain fees, which donors refuse to pay." "Plus, the organization has to bear expenses of the team formed to evaluate the implemented projects. Plus, we have to send audit reports of the projects," he said, adding, the process of seeking pre-approval for projects also hamper various humanitarian activities carried out by the organization. He said that the NRCS would send its representative to the council as soon as possible and try to resolve the matter. "We will meet with the council officials tomorrow [Monday] and we shall do as we are told," he said.